Today is Ganesh Chaturthi or Ganesh Festival. Everybody those who celebrate this festival must be busy with prayers and offerings for Lord Ganesh. This festival is celebrated since long time in Maharashtra but Lokmanya Tilak revived it during British era and it became a public festival. How it evolved since then is a different topic. Today I am going top tell you little about a story behind this ‘ Elephant Head God’. How he got his head and what is the significance behind his idol. A traditional legend about Ganesha’s birth is that Parvati, the consort of Shiva, created Ganesha out of mala (dirt) off her body while having a bath and breathed life into the figure. She then set him the task of guarding her door while she bathed. Shiva, who had gone out, returned and as Ganesha didn’t know him, didn’t allow him to enter. After the combat between Ganesha and Shiv Ganas, finally angry Shiva severed the head of the child. Parvati seeing this became enraged and Shiva then promised that her son will be alive again. The devas searched for the head of dead person, but they found only the head of an baby elephant. They brought the head of the baby elephant and Shiva fixed it on the child’s body and brought him back to life. This is how Lord Ganesha has a Elephant Head. 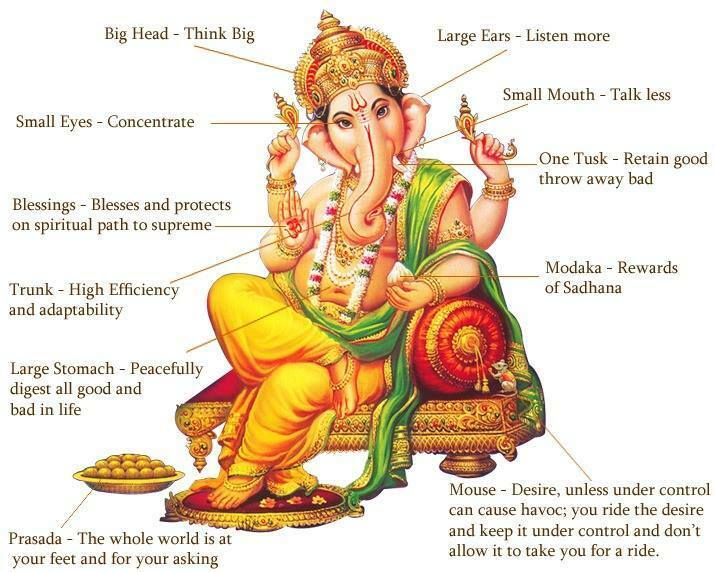 Ganesha is also known as Lord of Wisdom. He is also worshipped before starting any new venture as he is Vighnaharta (one who destroys all obstacles on the way). His entore personality has a significance which teaches us way of life. Below image will explain you what I mean. The more I learn about these things, I believe that behind most of the rituals there is a way of life or science, which we have forgotten over time. Anyways, this is totally different topic for discussion. On this note, I wish you all Happy Ganesh Chaturthi! May all be blessed! This entry was posted in This is Home and tagged Ganesh Idol Symbolism, GaneshFestival, Learning through Rituals. Bookmark the permalink.